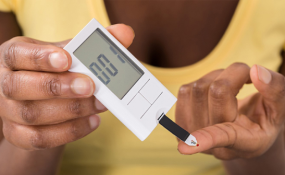 Is Nigeria Leading With Diabetes Cases in Sub-Saharan Africa? A woman testing for blood sugar level. The Governor of Edo State, Mr Godwin Obaseki, has challenged world leaders, researchers and charitable organisations to join efforts in finding a cure for diabetes. Obaseki made the call yesterday, in commemoration of the United Nations World Diabetes Day, celebrated on November 14, each year. He said, "while previous efforts at finding a lasting cure for diabetes have produced drugs with which diabetes sufferers could manage the health condition, millions of people across the world still bear the disease burden, denying them of fulfilment and happiness." He advised stakeholders, namely; research institutes, governments, non-state actors, pharmaceutical companies and charities, multilateral organisations as well as individuals to come together and create a common platform for a robust discussion on funding, the application of advanced technology in research to find a cure for the disease. "Individually, we all have a role to play in our collective fight against diabetes. Regular medical check, the right diets, exercise and an adjusted lifestyle could help put the disease at bay," Obaseki said. He emphasised the need for a proactive approach to the management of health-related issues and urged people to prioritise their health. "As a government, health care is a major pillar of our developmental plan for Edo State. One of our strategies is prevention. We are convinced that preventive approach as against a reactive approach, saves costs, if any, and eliminates pains and suffering associated with treating a disease. Our programmes on malaria and polio prevention, align with our preventive strategy" the governor said. He assured that his administration will heighten the campaign on preventive health care system as he begins his second year in office, to galvanise more people to place more premium on their health. In 2007 General Assembly adopted resolution A/RES/61/225 designating 14 November as World Diabetes Day. The document recognised "the urgent need to pursue multilateral efforts to promote and improve human health, and provide access to treatment and health-care education." According to the United Nations, the resolution also encouraged Member States to develop national policies for the prevention, treatment and care of diabetes in line with the sustainable development of their health-care systems. It explained that globally, an estimated 422 million adults were living with diabetes in 2014, compared to 108 million in 1980. The global prevalence of diabetes has nearly doubled since 1980, rising from 4.7 per cent to 8.5 percent in the adult population.